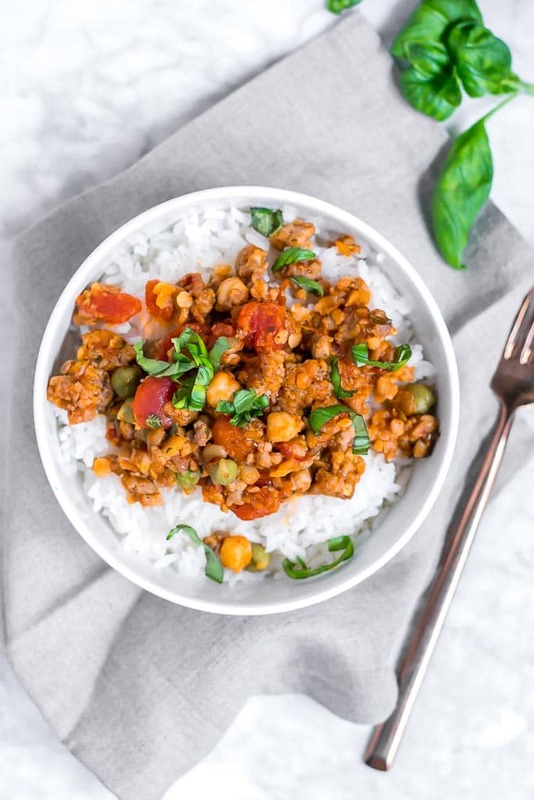 This post was sponsored by Path of Life.This one pot garbanzo lentil and italian sausage recipe is on the table in under 30 minutes making it a great weeknight meal! 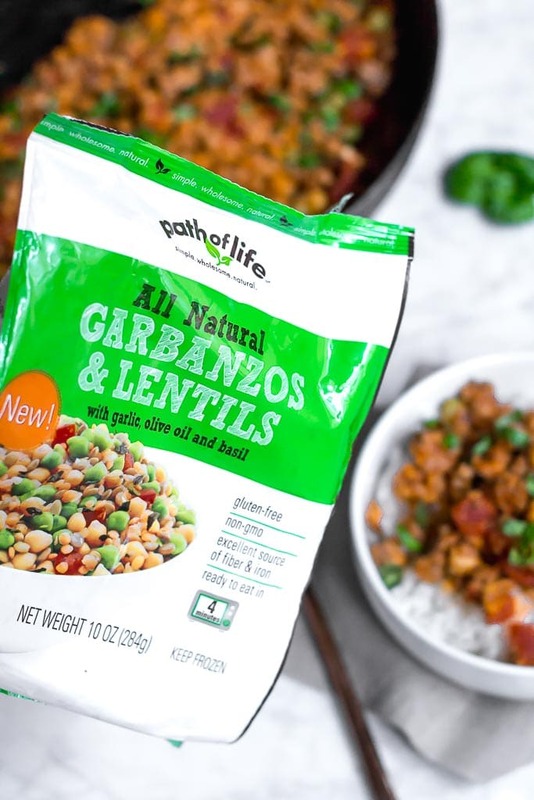 Using Path of Life All Natural Garbanzos & Lentils, making a gluten-free and dairy-free dinner just got a whole lot easier! If you know me then you know I’m all about those quick and easy gluten-free recipes. I know many of you like those, too! I know, life just gets crazy this time of year. No one wants to have to spend hours upon hours creating a gluten-free meal for their family. I totally get it. I only have one other person to cook for and I still don’t want to spend hours in the kitchen. I’m always trying to show you guys that gluten-free doesn’t have to be difficult and it doesn’t have to be bland. You can make delicious meals that are quick and don’t require a ton of ingredients. That’s where Path of Life comes in. I love using Path of Life products because they make my life a whole lot easier. If you haven’t heard of them before, they create frozen fruits, vegetables and grains that are gluten-free, and filled with simple, clean ingredients. I’ve also created a few other recipes using their products, including my grain bowl and roasted cauliflower tacos. Both are great for fuss free gluten-free meals. Dinner doesn’t get simpler than this. I used Path of Life All Natural Garbanzos & Lentils in this recipe, but I also love it as a side with a piece of chicken or salmon, too. 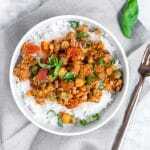 The bag contains garbanzos (chickpeas), lentils, olive oil, basil and tomatoes. All you have to do is microwave them in their steamer bags for the amount of time listed on the package while you’re browning the italian sausage and dinner is served just like that! Honestly, as soon as I opened the bag after it came out of the microwave, I couldn’t stop eating it. The first bag never made it into the pan with the italian sausage because I ate the whole bag on it’s own! The chickpeas and lentils are SO flavorful from the olive oil and basil. Have I told you how much I love basil? I swear basil just makes everything better. Let’s talk about some substitutions in this recipe. We’re using ingredients that already come packed with flavor. 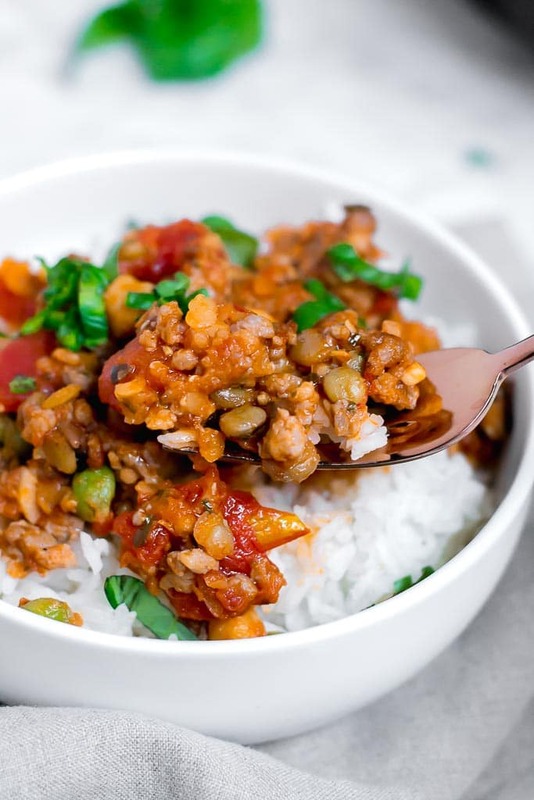 Marinara sauce is filled with spices such as basil and oregano, italian sausage contains fennel, and our Path of Life All Natural Garbanzos & Lentils contain olive oil and basil. SO if you do make any substitutions in this recipe, remember you might need to add salt, pepper, or spices to add in more flavor. For example, canned tomato sauce (i.e. tomatoes, salt, etc.) is not going to be as flavorful as jarred marinara sauce. So keep that in mind when you’re tweaking! This meal only requires a few ingredients and comes together so quickly, which is great for weeknight family dinners. You’ll love how much flavor is packed into it! 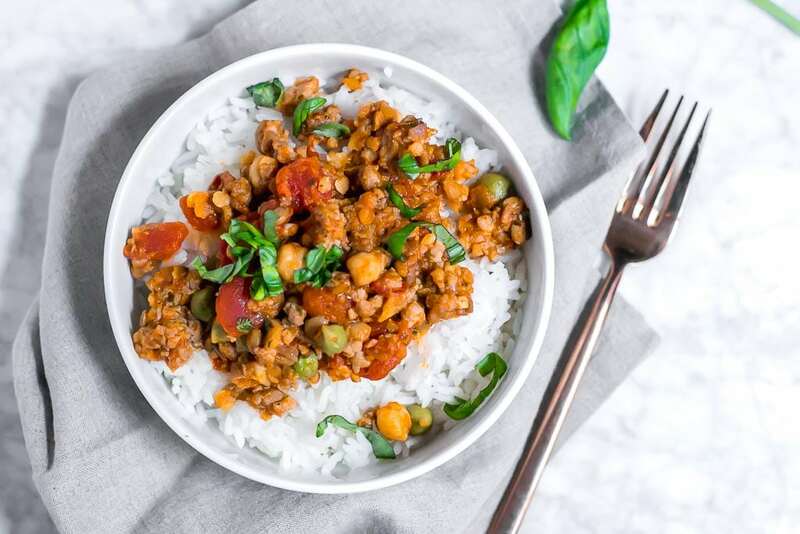 This one pot garbanzo lentil and italian sausage recipe is on the table in under 30 minutes making it a great weeknight meal! 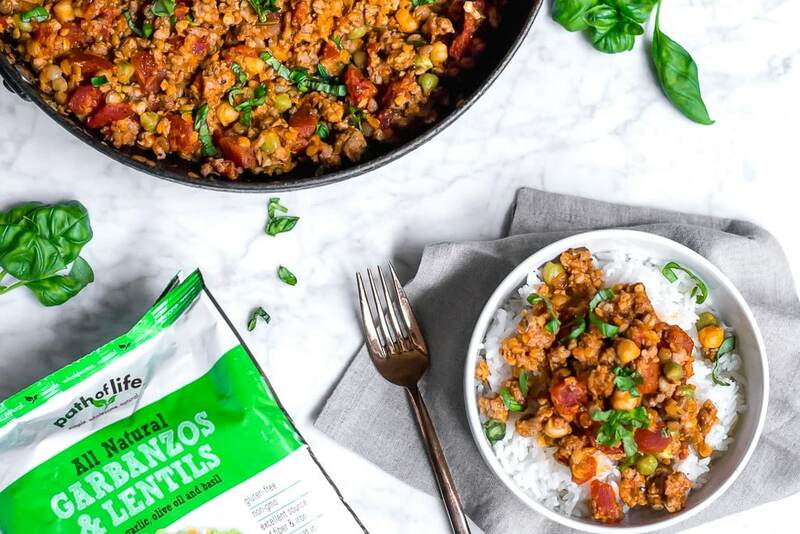 Using Path of Life All Natural Garbanzos and Lentils, making a gluten-free and dairy-free dinner just got a whole lot easier! Prepare Path of Life All Natural Garbanzos & Lentils in the microwave, according to package instructions. Preheat a large skillet over medium heat. Add italian sausage and break into smaller chunks with a spoon or spatula. Brown italian sausage 8-10 minutes. Add Path of Life All Natural Garbanzos & Lentils to the pan and stir to combine. Cook for 2-3 minutes. Add diced tomatoes and marinara sauce and stir. Let cook for 10-15 minutes on medium-low, until tomato sauce is hot, sausage is cooked through and everything is tender. Top with fresh basil. Serve over cooked white rice.